Never plug into the wall outlet again. Available in twelve or six quantities, portable battery packs allow you to charge your phone and tablet freely on-the-go. Includes all charging tips. Perfect for the home, office and business. Let your guests charge their phone with one of six portable power packs in a stylish dock. Free to use or pay per charge; you decide. Customize the charging station your company name and logo great promotional branding opportunity. Customers can take their power banks with them wherever they go, just leave an ID or deposit with the front desk. 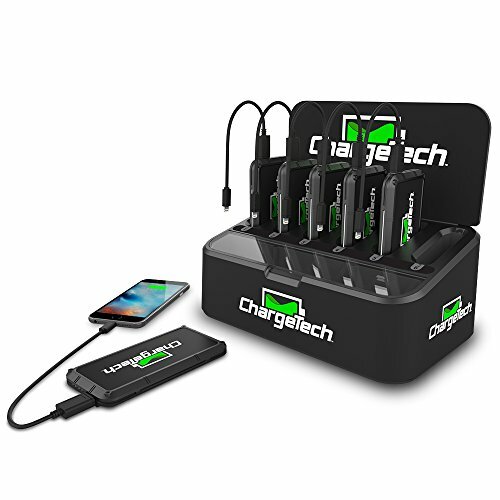 Six individual battery packs for your guests, family, or customers to charge freely at rapid-charging speeds. Each battery contains 5,000mAh of power, enough to charge a smartphone up to 150% or a tablet up to 100%. Return battery packs back in the hub to recharge them in just 45 minutes! Perfect for the home, office, or business. Station comes with 9 universal charging cables compatible with all Apple and Micro USB devices. Satisfaction guaranteed - Power supply is completely UL Safety Certified (E304160). Your satisfaction is 100% guaranteed. We offer a 30-day money-back guarantee and a 12-month warranty on all products. Phone, email, and live chat available on our website!